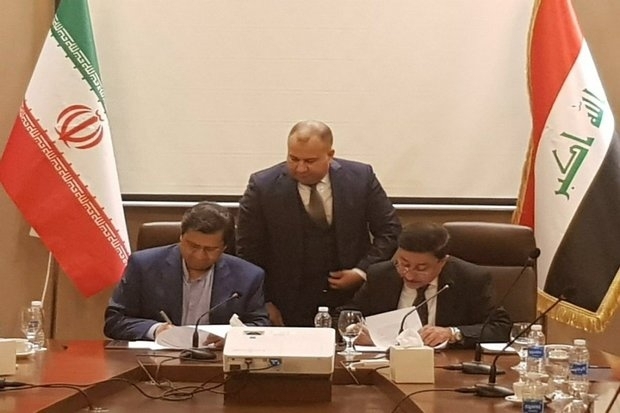 Governors of the Iranian and Iraqi Central Banks have signed an agreement on a payment mechanism designed to facilitate the settlement of Baghdad’s debts to Tehran. The two sides inked the agreement following negotiations between members of their delegations in Baghdad. Upon arrival in the Iraqi capital, Hemmati told IRNA that his trip was aimed at removing the obstacles that hinder the settlement of Iraq’s debts to Iranian exporters. In addition to natural gas and electricity, Iraq imports a wide range of goods from Iran including food, agricultural products, home appliances, and air conditioners. The value of Iranian imports to Iraq was about $6 billion for the 12 months ending March 2018, about 15 percent of Iraq’s total imports for 2017. The energy contracts between the two countries also contributed to a volume of trade of $12 billion last year. Iran is currently Iraq's top trade partner, having sharply increased their trade exchanges in recent months despite U.S. sanctions on the Islamic Republic. The US government in November re-imposed unilateral sanctions against the Islamic Republic of Iran and urged all countries in the world to stop doing business with Iran. After giving the waiver, the U.S. said that Iraq could continue to import natural gas and energy supplies from Iran as long as it did not pay Iran in U.S. dollars.Therefore, the country officially removed the U.S. dollar in trade with Iran, and started working on the use of local currencies in its economic ties with Tehran. Following months-long preparations, foreign ministers of France, Germany and Britain finally unveiled the mechanism - officially called the Instrument in Support of Trade Exchanges (INSTEX) - on Thursday following a summit in Bucharest. Pointing to the significance of the Iraqi market for Iranian traders, Hemmati stressed that the two sides will put all-out efforts to overcome shortcomings in financial transactions, which have created some hurdles for Iranian exporters. Iraq is now the second top destination of Iran’s non-oil exports. According to the Islamic Republic of Iran Customs Administration, Iran exported goods worth over $7.5 billion to Iraq during the past 10 months of the current fiscal (through Jan. 20), indicating a 45% rise in comparison to the similar period of last year. Hemmati further pointed to the U.S. sanctions against Iran and said by waging an economic war against the Islamic Republic, Washington has made extensive efforts to disturb the economic and political conditions of Iran. However, he added, with the arrangements made by Iran, fortunately, the enemy plots have been thwarted and the Iranian economy has become stable. Speaking at a joint press conference with Iraqi President Barham Salih in Tehran in November, Iranian President Hassan Rouhani said the value of trade and economic interaction between Tehran and Baghdad stands at around $12 billion, adding that the two neighbors have the potential for a $20-billion trade target. Rouhani hoped that cooperation between Tehran and Baghdad would contribute to regional security and stability.